When you scrapbook digitally you need lots of tips and tricks to get the most creative results. Flatten and clip is my favorite trick! It sounds sort of complicated at first, but once you get the hang of it, this will become one of your best friends for your digital scrapbook. I can’t live without it. It’s really as simple as: Select, Flatten, Copy, Revert, Paste! Don’t worry…I’ll explain each step as we go. Basically what this trick does is prevent unwanted transparency effects when using Blending Mode settings. 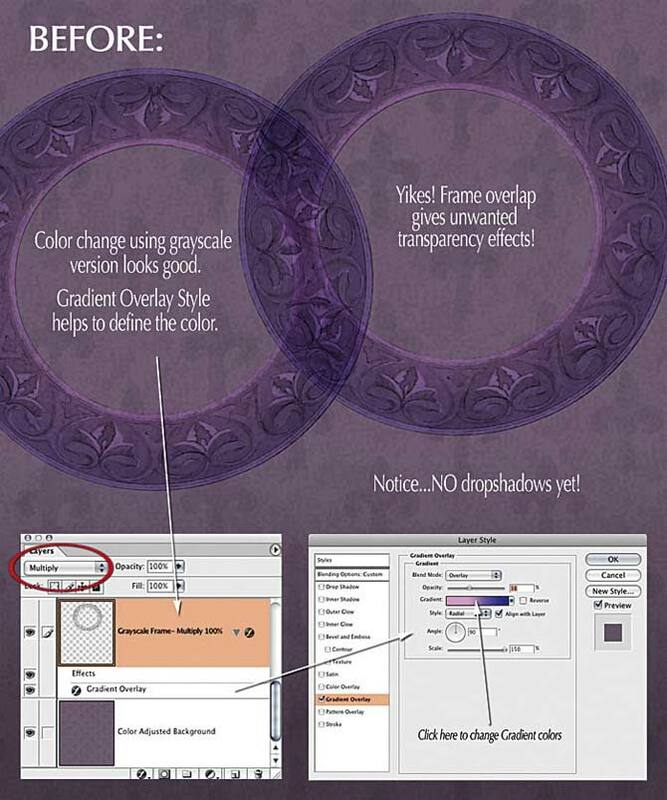 When layers in a Photoshop scrapbook document are set to a Blending Mode such as Luminosity or Overlay, etc., the layers BELOW affect the layers ABOVE and vice-versa. 1. SET-UP: Choose a blending mode style for your scrapbook object layer from the top of the layers palette. Place the layer where you like the effect the best. Use whatever multiple effects you like here: Gradient Overlays, different blending modes, Pattern Overlays,..whatever you want! 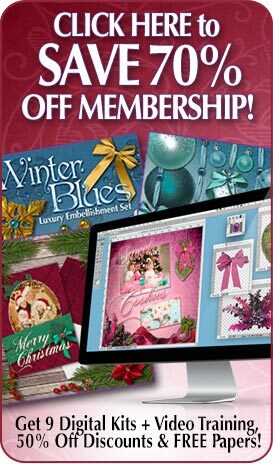 You can even mask, group and merge items like we did previously until you have what you want for your scrapbook. Important: Don’t add drop shadows yet…those will be applied at the end. You will eventually end up with a nice clean scrapbook object that you can use and still have the ability to adjust your drop shadows to fit your final layout. You can also save copies of the finals and use them in other scrapbook layouts to save yourself some work. In the example, I desaturated a circle frame layer from my Illuminations scrapbook pack to greyscale and changed the blending mode on it to Multiply. See the first part of the “Inversion Trick” below for how to do this. I also added a Gradient Overlay style to it with a radial color blend to make it lighter in the middle and darker on the edges. 2. SELECT: You may want to save first at this point, before going on, depending on how brave you are! Now, make the scrapbook object(s) on the layer into a selection. Use a Select All command or you can Command+Click on the layer preview thumbnail in the Layers Palette (Mac). PC users can try using Control+Click. Make sure you turn off any layers that are overlapping your scrapbook object so you get JUST the object you want shown. In this case I turned off the circle frame on the right before I selected and flattened. 3. Flatten: Here’s the scary part! Flatten your whole image temporarily. Yep, flatten it! Here’s the important part: DON’T DE-SELECT! You’ll need this selection “live” to make your copy. No worries… we saved it already, so it’s not that scary. You can always undo or go back to the last save. Now we’re ready for the second part of this scrapbook trick. 4. COPY: Copy your selection using either Command+C or Control+C. You won’t see anything happen, but it’s there, waiting in memory to be pasted somewhere. 6. Paste: Paste the selection back into your document using Command+V or Control+V. This should paste it back in on a new layer. Make sure your new layer is set to Normal Blending Mode. Now you can move it wherever you want! This little sequence merges the “Blending Effect”. Since the “flattened & clipped” layer is now set to “normal” it will no longer change when you move it around, but it still has the nice effect. If your program does not have a History Palette or equivalent, be sure to save your file BEFORE flattening, then paste the selection into a separate document on a transparent background. If it’s not transparent, you’ll have to select it again and get rid of the background, which is a real pain. Save this as a separate file if you wish. You can then re-open, revert to your original, or step back in your history to the unflattened state on your original layout. Then just copy the “clipped” item back into the original document. You can even start the whole process again at this stage, applying more layer styles, blending modes, and then flattening and clipping again using the new scrapbook object you have created. Last, add your Drop Shadow using a layer style and you’re done! A softer, wider drop shadow works best for realism, rather than a harsh, dark one. Too wide and it will look smudgy, so don’t take this too far. Make sure to zoom out often and assess your progress, matching up your drop shadows for a consistent look throughout the whole scrapbook design. For more effects, try INVERTING the item before setting your blending style. You may may want to use the Flatten & Clip Trick before this step or after, depending on the look you want. Sometimes converting the layer to grayscale before doing this will also give nice effects, especially for an antique scrapbook look. To do this be sure you are on the layer you want to make into greyscale and use Image > Adjustments > Desaturate. Don’t use Image > Mode > Grayscale or you will turn your whole document into black and white and not just the layer you are working with. 1. Place your selected scrapbook file on your favorite background. 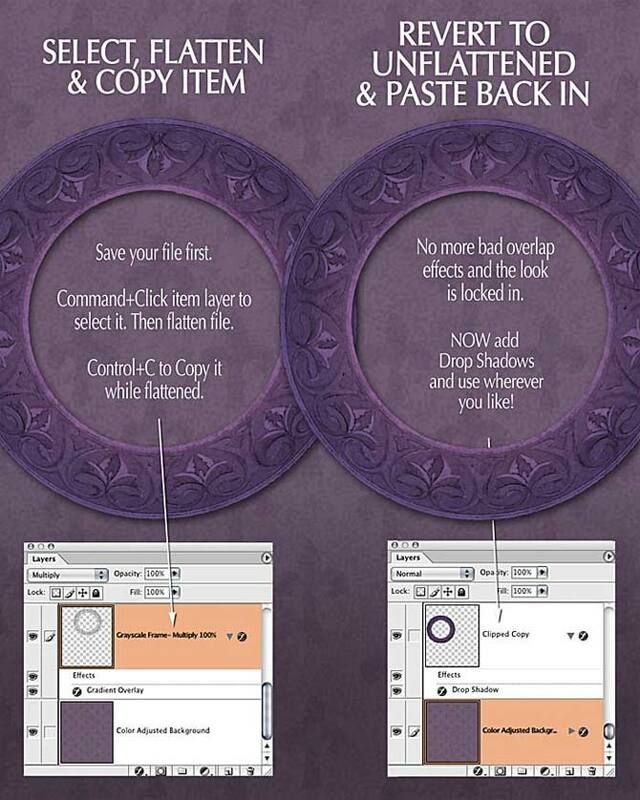 Select its layer and go to Image > Adjustments > Invert. Adjust the brightness and contrast if desired. 3. Add your drop shadow…all done! You learned all that ALREADY?